Enter the keywords you want to search in the "Keywords" field. 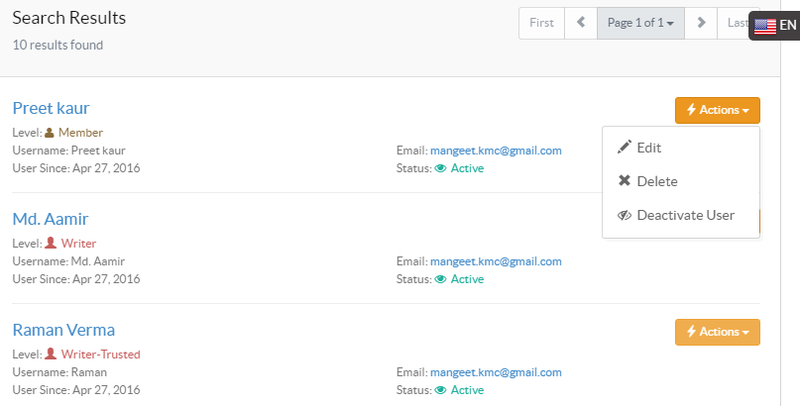 "Search-In" field allows you to search the users by name, email address or username individually or in all together. Any Word will return results that contain any of the keywords you have entered. All Words will return results that contain all the keywords you have entered. 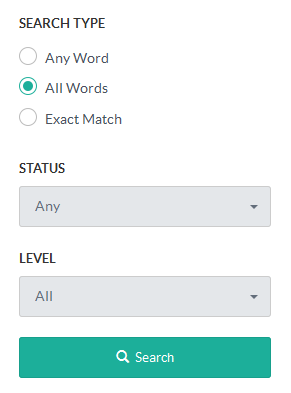 Exact Match will return results that exactly match the keywords you have entered. Select Active in "Status" to search for active users and Inactive to search for users with inactive status. By default, Any is selected which will search for both active and inactive users. Select a "Level" (See: PHPKB Users ) to search for specific type of user. By default, All is selected which searches users irrespective of their level. Result screen displays user details such as name, username, level, email address and status. You can click on Actions button to edit, delete or deactivate the user.